I know a lot of people love this plate and I finally jumped on the bandwagon and got it, even though it wasn't one of my first choices. I don't regret it though, because some of the images on this plate are just gorgeous and they stamp great. 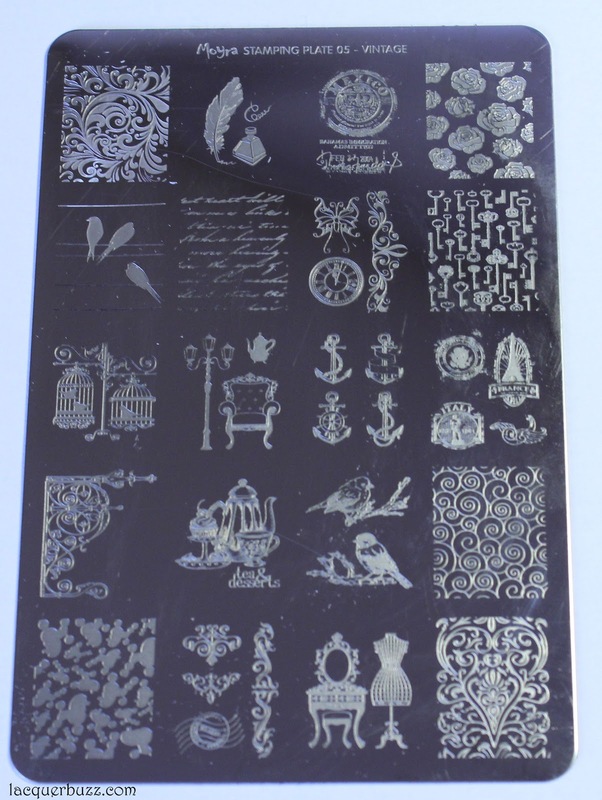 It's difficult to say how many full nail images are on this plates, as some of them are made out of smaller ones so they can be used both as a full nail image or individually. 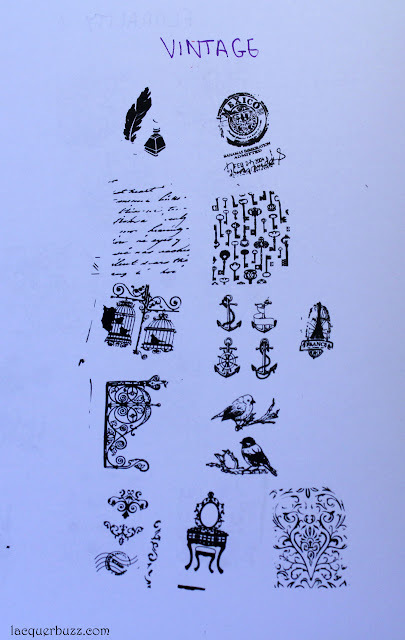 There are a few patterns on the plate, and then a wide variety of birds, anchors and so on. 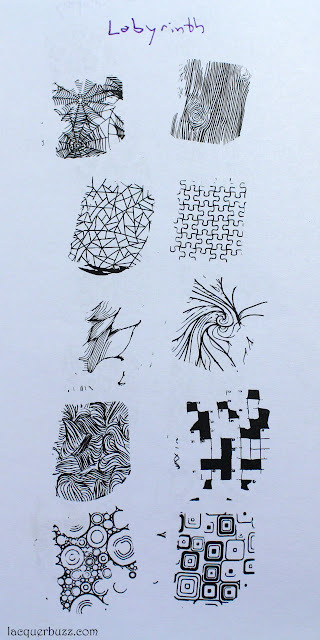 All the images on this plate stamp great, even the ones with finer lines. I did my swatches on paper and used a sticky stamper, so everything that didn't transfer properly is entirely the fault of the paper plus stamper combo. The plate works great, trust me. 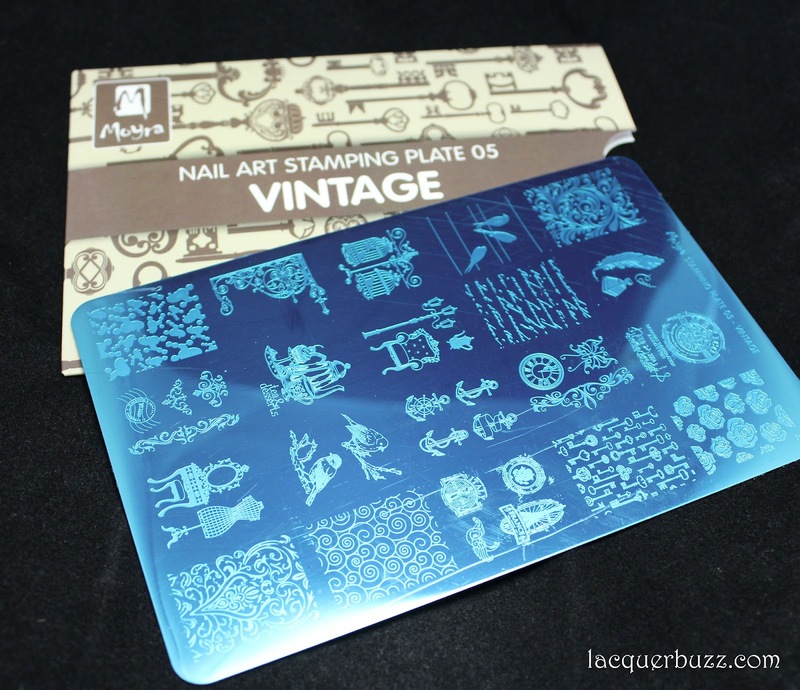 I used this plate to create my vintage calligraphy manicure using different stamping polishes and you can see that everything worked like a dream. Next up we have the 06 Florality 1 plate, which is another favorite for many people. Again this wasn't one of my first picks but I got it later and was very pleased with it. Here's how it looks. 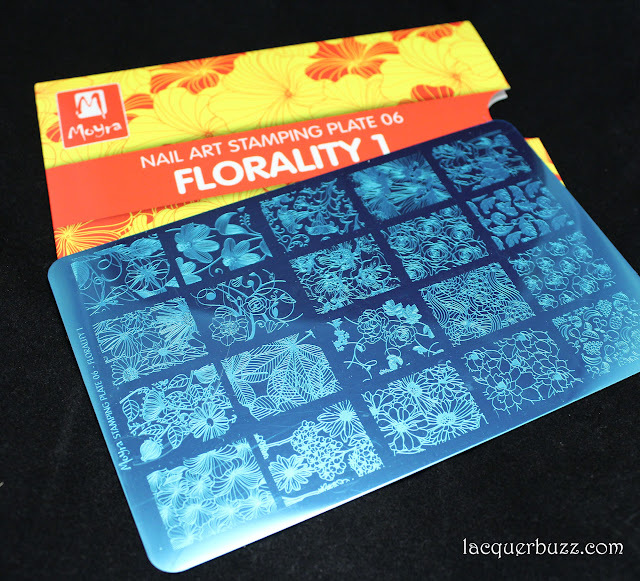 The Florality 1 plate has 20 full nail images that are, you guessed it, entirely floral. 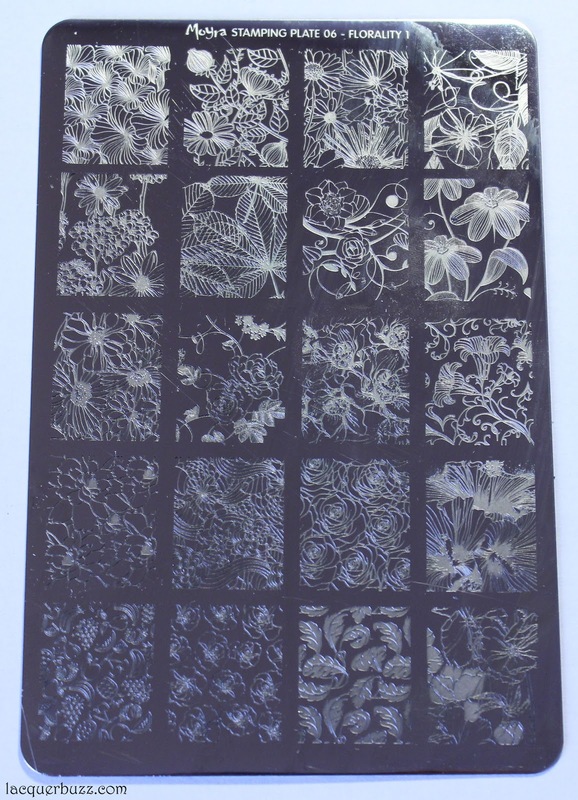 Some of the images are of leaves or fruits instead of flowers, but they still stick to the same theme. The lines on this plate are very fine but I'm happy to report that I didn't have issues with the stamping. All the mistakes you see below are because of the aforementioned stamper plus paper combo. I'm really happy with how this plate works. I used this plate to create my simple roses from a few weeks ago. 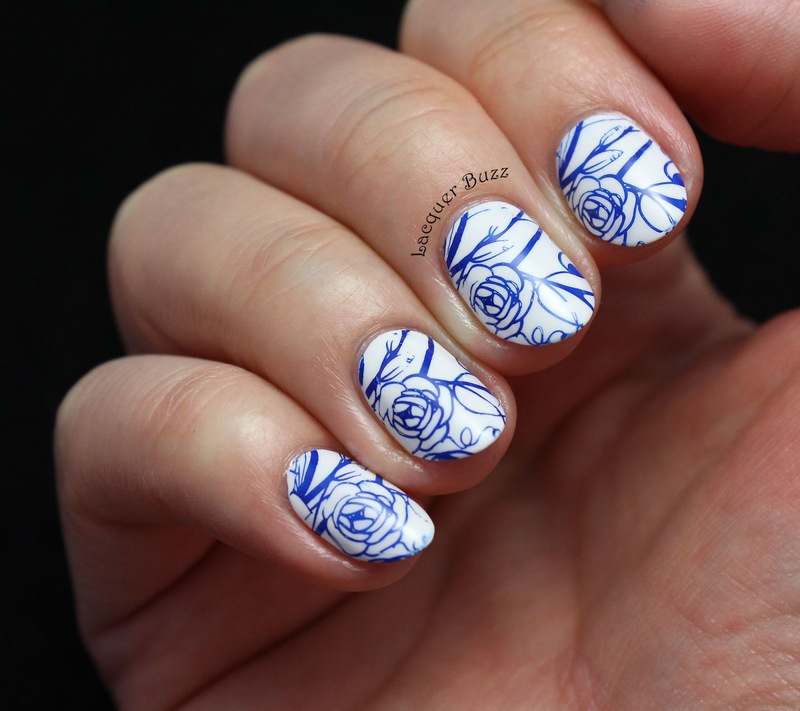 This delicate image worked pretty well in combination with the blue Moyra stamping polish. Plate 07 Labyrinth was the one that I was absolutely dying to get. It was out of stock everywhere when I first ordered some of the Moyra plates, but then I was lucky enough to find it in a local shop. Because I got it separately from the others I forgot to take a picture of it before I took the blue film off. So all I have is a picture of the plate itself. As you can see, there are some very cool images on this plate, a total of 20 full nail images if you count the fingerprint in the top right corner as such. 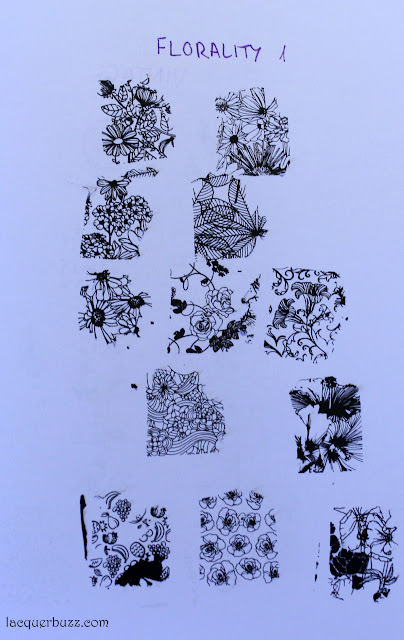 There is a great variety of stuff on this plate, from psychedelic patterns, to barcodes and spider webs. Unfortunately my plate is not very deeply engraved, which means that some of the images that contain thinner lines are very hard to stamp. I tried several stamping polishes and stampers, but I couldn't get the crossword puzzle and barcode images to work properly. Some of these work if you use a very light hand while scraping and work fast. Here are some swatches. Since I've had this plate for a while now, I've used it for several manicures. 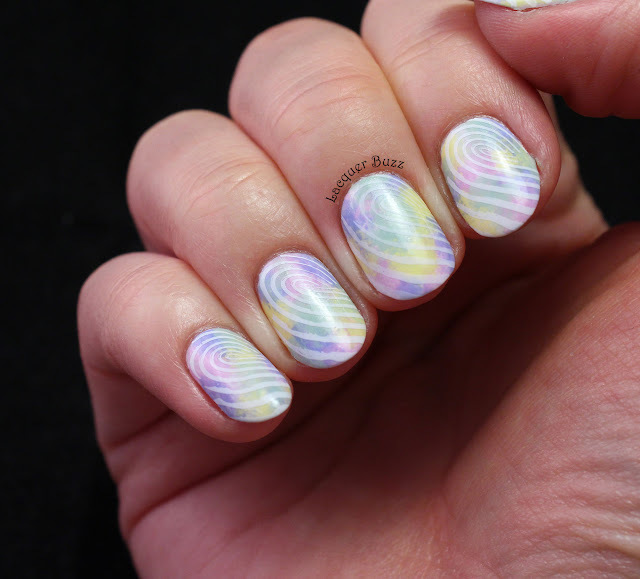 My favorite one remains the very first one I did, which is my spring watercolor mani. Last but not least, we have plate 15 Lacelove, another crowd favorite. I've always loved the intricate designs of lace on my nails, so this one had to be mine. This is the plate. 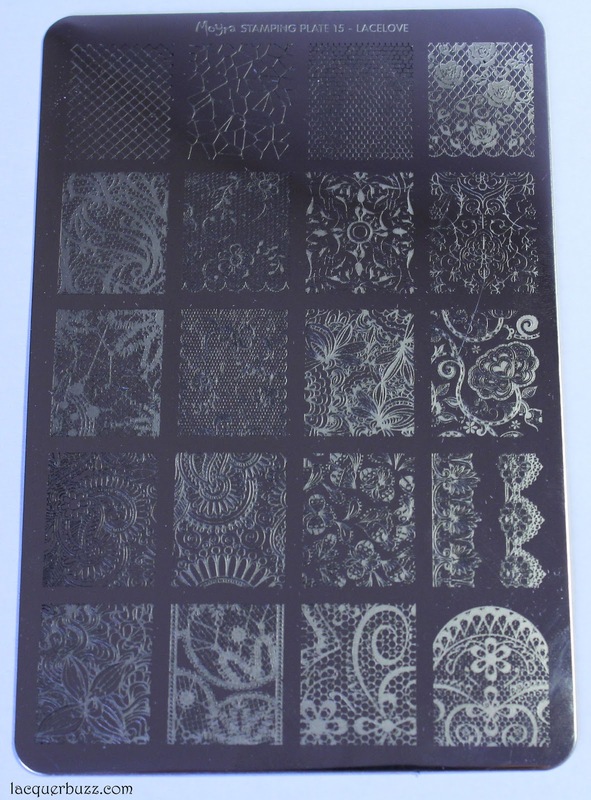 This plate consists of 19 full nail images and two lace band ones. The designs range from the traditional lace and mesh, to intricate ornaments and mandala like patterns. 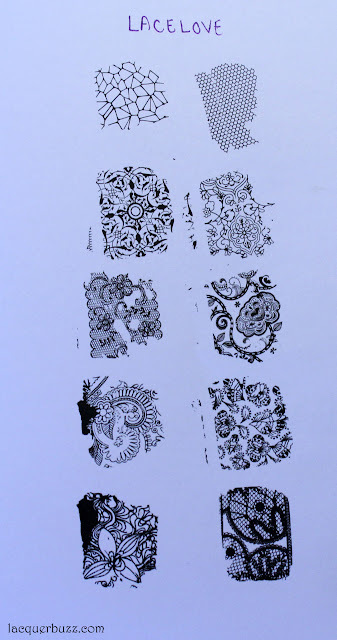 All the designs from this plate pick up wonderfully, but again I had some issues with the transfer on paper because I was using a sticky stamper. They do have very thin lines in them so you have to work fast because otherwise the polish dries in the design before you pick it up. I used this plate to create my laced up manicure from a few weeks ago. Here's how it looked, in case you forgot. So this finally wraps up the reviews for the 10 Moyra plates I own. I don't know if I will be getting more in the future, since I pretty much satisfied the cravings I had. Maybe if they come up with some now ones I will be interested in those. As a conclusion, the Moyra plates are great value for money, with tons of unique and original designs. 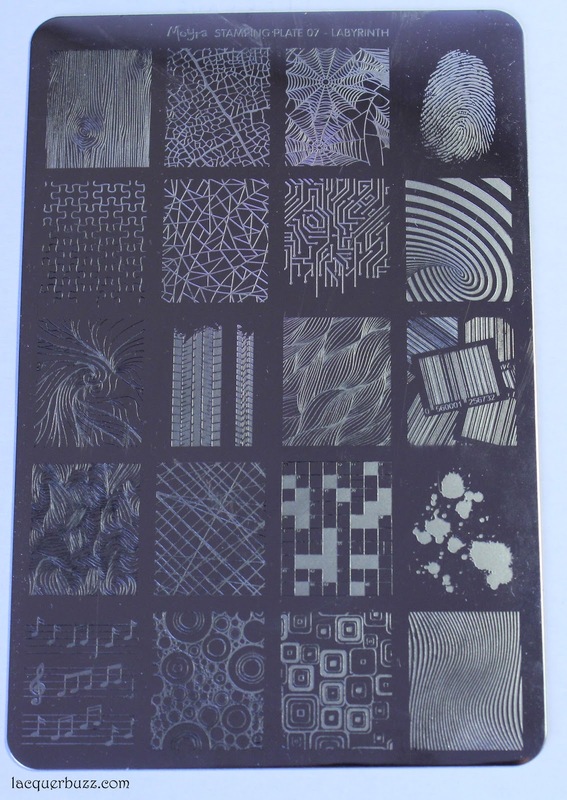 The engraving is not 100% good, so there might be a few plates that are harder to work with, but I'm willing to take the risk for such a low price. 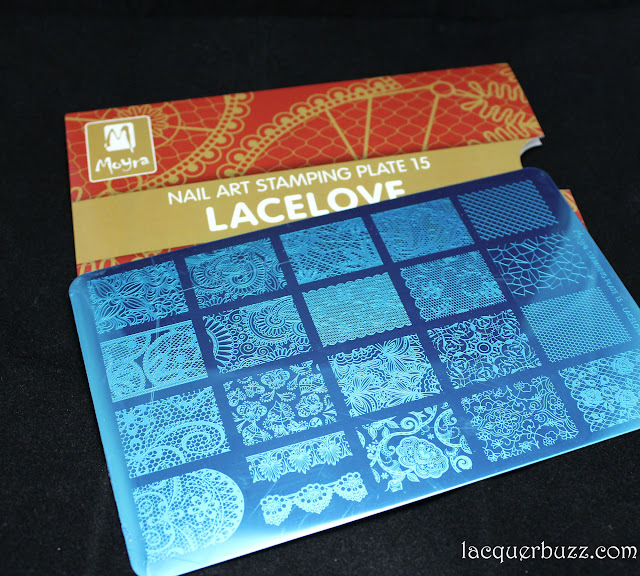 Next up, I will show you the Moyra stamping polishes. But until then, have a happy and relaxing weekend!